Your Wedding day is one of the most important days in your life and you will have spent a lot of time in the planning to make sure everything is perfect. You will want to make sure that your perfect day has a perfect ending with disco entertainment that will ‘wow’ both you and your guests along with entertainment throughout the day. 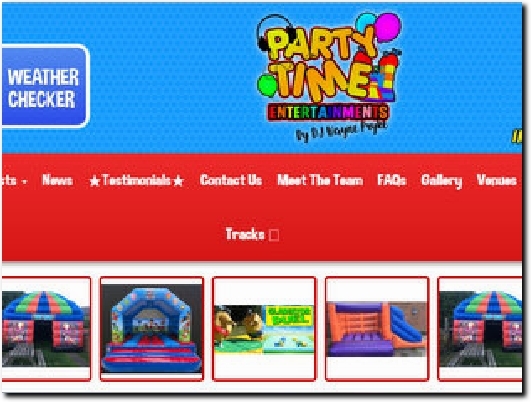 Party Time Entertainments has provided high quality Disco & Bouncy Castle Entertainment at hundreds of weddings and is able to create the right mood and atmosphere that will ensure your guests have a fantastic time and dance the night away! Northants-based hirer of a wide range of entertainment equipment, especially inflatables, but also operates a disco. Wedding Services gives details of what can be provided, including the Just Married bouncy castle, with the cost of various packages. There are numerous testimonials from happy clients while Gallery shows the equipment in action. Contact Us has phone and e-mail details and an enquiry form. There is also a comprehensive FAQ section.